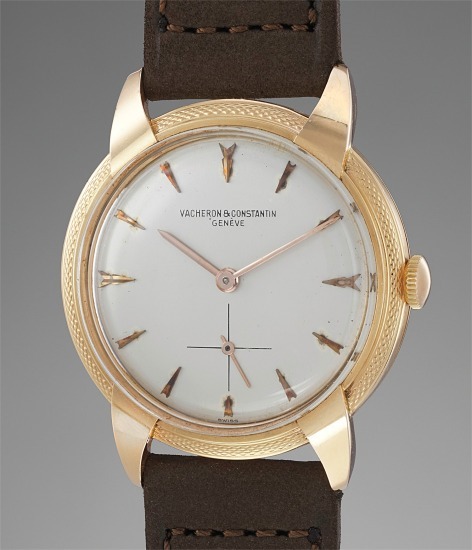 Vacheron Constantin’s willingness to offer alternative designs to classical dress wristwatches appears as early as the 1920s. The brand’s innovative and sometimes disruptive designs are well known amongst collectors and fancy lugs have become a key element of the brand's DNA. The present reference 6022 was launched in the early 1950s and nicknames "Diavolo" due to the resemblance of the lugs to the devil's horns! The polished lugs present a striking contrast to the delicately guilloché case giving the watch incredible personality. The present watch is presented in very attractive condition. Its pink gold case retains strong proportion and the patina on the dial attests the love this watch has already received from its original owner. Because of its condition and distinctive design, we can confidently say this timepiece would move any collector who chances upon it.